Money is the number one reason for an employee contract! These contracts may allow for termination of employment by the employer and employee. A Contract of employment is an agreement between an employee and employer. These contracts specifically outline the duties and functions of the job. Many employment experts point out that a detailed contract of employment can be very good for both sides. A good contract makes the conditions of the job predictable. Would you buy a business without knowing the exact details? Would you buy land without having ever seen it? When you apply for a loan you have to read and sign a contract. Most people don’t think about taking employment without first getting an employment agreement contract. A job is very important when it comes to keeping a roof over our heads, keeping the lights on, sending the kids to college, etc. Unfortunately most people don’t think about the need to have a written contract with the businesses that hire them. ...agreement will specify the terms of employment including pay, type of work and hours. These agreements are based on the type of employment, the sort of business, and the duties of the new employee. They should clearly describe what the employee does for the employer. precisely what benefits or fringe benefits such as employee stock options, health insurance, disabilty leave, vacation leave, etc. employee discretion regarding company trade secrets, procedures, personnel and customer lists, etc. this can include moving expenses, bonus incentives, operating expenses, salary, etc. High ranking officials like CEO’s and other company officers routinely sign an employee contract. This agreement of employment regularly has a provision for monetary compensation or severance pay if the employee is terminated for some dispute. Hello I’m Yancey, as an IT professional I found it surprising that contract employment isn’t normally signed by employers and employees in the IT industry. Employment professionals, attorneys and IT officials see employers decreasing their use of employment contracts. The perception is that employers don’t want a contract to limit there ability to fire an employee. The “at-will-employment” doctrine is responsible for this view. When an employee is hired at will, the company can fire the employee for any reason or no reason. This is not true if the employer is in violation of some state or federal law. The employee can also fire the employer for any reason and without notice. The legal presumption is that if no employment contract is in place the employment is at will. Businesses perceive that contract employment removes the freedom of at will. 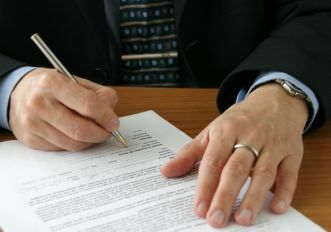 Some legal experts believe that clearly written contracts of employment make the resolution of disputes uncomplicated. Is there someone you care about needing to know what an employee contract is? If so then TELL A FRIEND about this page below. I know as an employee I would love to have a contract of employment with my employer. Why? If there is a dispute I would just review the terms of the contract with the employer to prove the rights and responsibilities of both sides. If the employee or employer isn’t abiding by the conditions of the contract and no resolution can be found, then a lawsuit may be appropriate. An employment agreement will bind an employee to the company for a specified period of time. If the employee is profitable to the business they couldn’t just up and leave. This would be in violation or breach of the contract. Sudden an unexpected loss of quality employees can be devastating to a business. The employee would be required to stay around until an adequate replacement could be hired and/or trained. Contract employment may also benefit the employer by luring quality employees away from other companies. An employer may agree to provide long term employment and attractive benefits or incentive packages. A condition of a contract of employment could be an expected degree of job performance that’s tied to a termination policy. If the expect duties are not carried out, it might not be as hard to fire the employee. The employee has a greater advantage if there is an agreement of employment in place. This is especially true if the employee is at the executive level or highly skilled. The employee with the contract has to be dealt with differently from the employee that doesn’t. The agreement of contract employment is binding on the employer and the employee. If the employer decides the contract is not to her liking she just can’t change or get rid of it or you! A contract restricts the company’s ability to do this. Since the contract agreement is a two way street, the employer has to re-negotiate with the employee any changes made to it. The employee that does not have a contract of employment is subject to being treated as “at will” and the employer will usually have an easier time of changing whatever and whenever it wants. The main benefit to the employee is the protection they have if and when the management changes and gets amnesia about what was promised. The contract reinforces that all conditions in it will continue to be met. Under an employment contract the employer has to treat the employee fairly or what’s called a “covenant of good faith and fair dealing”. It could mean big trouble for the employer that fails to do this. Imagine your company almost being forced to deal with you fairly! Now you see why I favor an employee contract! I found this magnificent resource that provides free employment contracts, job agreements and other employee forms written in plain straight forward English that's easy to understand. I highly recommend it for every job seeker and employee! Common-law rights apply to anything not covered in an agreement of employment. That means the employee has ownership of all inventions, ideas or things discovered, unless she was clearly hired by the company to create those inventions and ideas. Businesses will not benefit from contracts of employment, is the contention of several business analysts. They believe employment contracts undermine worker loyalty, dedication and trust toward companies. They also believe such contracts increase turnover because of the work environment becoming increasingly information based. Small businesses are seen as the means by which employment contracts have grown in recent years. This is particularly true in the internet software, high-tech companies operating in non traditional settings. Multi-billion dollar businesses working in homes, basements, garages, etc. 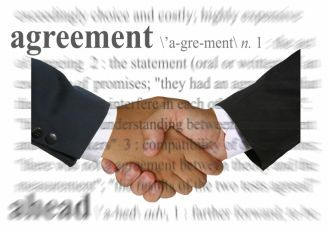 are utilizing employee agreements to aid in their success. Again employees with contracts are in more secure and stable work environments than those that don’t. An employee contract is not for everybody or for every circumstance. Employees and employers alike should consult with qualified employment attorneys or other experts before entering into any legally binding situation. As a fellow employee I’m continually educating myself about issues that affect my employment. These pages will help you as well. Check out my page that gives more information and an employee contract example.